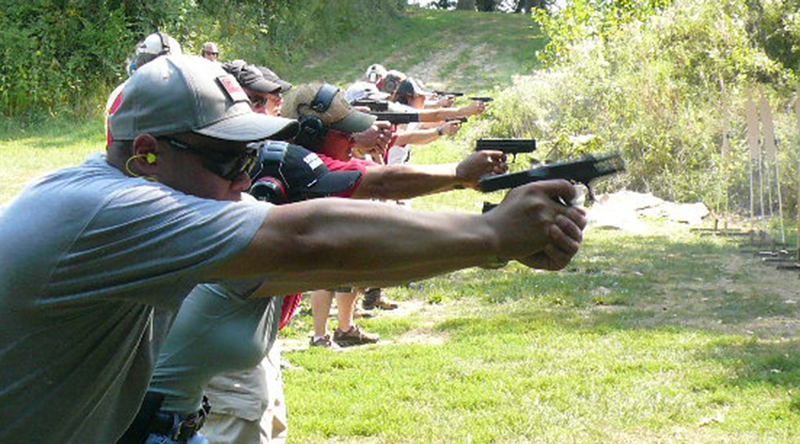 This intensive one-day program introduces the new or novice shooter to combat handgun training. Included in the program are firearms safety issues, marksmanship basics, various shooting positions, speed reloads, drawing from a holster, and more. This is designed for the shooter who has never had formal firearms training or would like to review the fundamentals. Emphasis is placed on trigger control, sight alignment, accuracy, and safety. 300 rounds. No prerequisite required. Run a revolver as fast as any semi-auto. Learn the secrets of fast, smooth manipulation of a double action trigger pull and quick reloads. Whether the revolver is your main defense gun or the backup in your pocket, these skills are essential. Mastering The Revolver is for all those interested in a return to traditional values. This one-day class is designed to teach the budding wheel-gunner several techniques that maximize the revolver’s potential. A strong revolver shooter becomes a better semi-auto shooter. This is a class that improves your trigger control and recoil management regardless of the type of gun you generally use. If you have a revolver as a back-up gun this is a “must have class”. An essential class for instructors who may have revolver shooters in their courses. Learn at least five different reloading methods and why the revolver is still the weapon of choice from behind cover. Subtle nuances and the lost secrets of running the revolver at hyper-speed are all explored. Students will need a quality revolver, holster, at least three speed loaders, and 500 rounds. No Prerequisite. This is an intense, four-day, 40-hour immersion course in the “rules of engagement” for armed law-abiding private citizens. The course emphasizes legal issues, tactical issues, and aftermath management. Topics will include interacting with suspects, witnesses, responding police officers, threat recognition and mind-set, and the management of the social and psychological aftermath of having to use lethal force in defense of self or others. Also covered is preparing beforehand for legal repercussions and minimizing your exposure to them. Situations in the home, at the place of business, or “on the street” will all be covered. Range work will include instruction in the use of the defensive handgun under extreme stress. Drawing from concealment, two-handed stances, shooting from cover, one-handed stances with either hand, speed reloading, and more are taught with an overall emphasis on fast, accurate shot placement. The course will culminate with a written examination covering the classroom topics and a police-style handgun qualification course. 500 rounds. No prerequisite. Designed by Bob Houzenga and Andy Kemp as an addition to Massad Ayoob’s LFI curriculum and originally taught as LFI Advanced Handgun Skills, this two-day course is fast paced and demanding, focusing on high speed drills designed to build the optimum blend of speed and accuracy. Ideal for the advanced shooter who wishes to hone and fine-tune his techniques. Novice shooters move up to the next skill level. Emphasis on individual diagnostics and the subtle nuances used by six-time National Champion, Bob Houzenga. From fast and furious, up close shooting, to accuracy work at 25 yards, this program offers students of any skill level, an opportunity to take their skills to the next level. Recoil management for super-fast follow up shots, rapid first shots from the holster, swift engagement of multiple targets, strong and weak hand techniques, “catching the link”, and shooting “out of the notch” are just some of the topics covered. Many students find their speed doubles or triples with better accuracy. 1500 rounds required. Prior formal instruction is a pre-requisite. The ideal follow up to Advanced Handgun Skills. Designed for the advanced student, this program addresses the tactical matters and concerns that accompany defensive shooting along with very advanced skill sets. Some of the topics covered include: one hand reloads, Tactics in and around vehicles, moving targets, weak hand draw from a strong side holster, engaging from cover, close quarters issues, prioritizing targets, when to draw and when to disarm, intro to weapon retention and disarms, and much more. Class also includes a night shoot where student will learn several different flashlight techniques and low –light shooting skills. Scenario testing is used to reinforce learned concepts. Students should already be well grounded in firearms safety and marksmanship. Prior formal training is a prerequisite. 800 rounds required.